What can you do with an iPad Pro? In this tip, we will show you 5 cool things you can do with your new iPad Pro. Download AnyTrans to transfer data to your new iPad Pro after reading this guide on what you can do with iPad Pro. 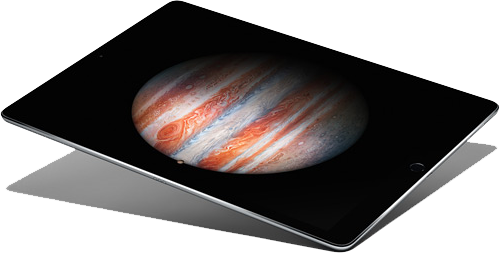 Apple has officially released the latest iPad model – the iPad Pro on Nov. 11. It is new, it is big, and it is also expensive. The new iPad Pro has a 12.9-inch retina display, making it the largest iPad in Apple tablet lineup. Should you get the newest iPad? If you haven’t made your decision on whether you should buy an iPad Pro, you need to check this tip on 5 cool things you can do with iPad Pro. The resolution of iPad Pro is 2732 x 2048 meaning 264ppi image, making it the highest resolution Retina display Apple has ever produced for iDevices, even besting the resolution of the 15-inch MacBook Pro. With iPad Pro, you've got an impressive viewing platform when away from your TV. It will also be pleasant and amazing to play video games on your BIG iPad Pro. The larger screen will also allow you to take full advantage of iOS 9's multi-tasking feature. Slide Over, Split View, and Picture in Picture on iPad Pro give you new ways to multitask, and this extra screen means greater ease when multi-viewing apps side by side which should be like having two iPads next to each other. The Stylus Pencil offers you a way to interact with that scans twice as often than touch. The Pencil can detect angle, position, force and tilt so you can use pressure for darker lines or angle the stylus for thicker lines. The Pencil will work with Microsoft Office for quick drawing of objects or annotations of documents. Thanks to a built-in Lightning connector you can directly charge the Pencil from the iPad Pro, on the move. Although the huge screen offers a decent touchscreen keyboard, some of you still prefer a real physical keyboard. That’s why Apple has introduced its Smart Keyboard case. The fold-out and stand out smart keyboard allows to be connected to the iPad without plugs or wires or Bluetooth pairing. With iOS 9, you can easily switch from virtual to physical keyboard mode, enabling you to type quickly. The iPad Pro packs an incredible four speakers, the iPad Pro that means double even three times the volume of the two stereo units available on the 9.7-inch iPad Air 2. It ought to prove an excellent multimedia device for watching movies or just listening to music in your living room. If you want to transfer photos, videos, music, contacts and more from computer or old iPhone/iPad to your iPad Pro, you can download AnyTrans to accomplish that. It is a versatile iOS data manager that works for iPhone, iPad, and iPod. The iPad Pro starts the price at $799, and there is no excuse for you not to take care of it. Check the basic maintenance tips for your iPad Pro to better maintain it.